The Infusion Cohort Program was an intensive and sustained professional learning program for artists and teachers focused on arts integration in schools. 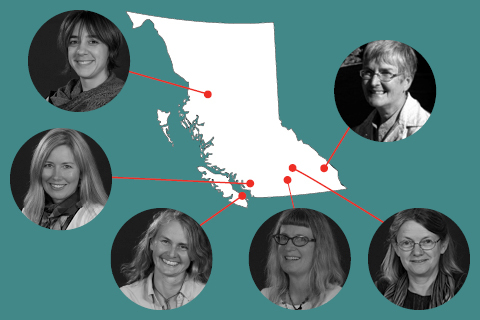 Taking place from September 2012 to June 2015, six professional artists collaborated with a team of educators in six elementary schools across British Columbia to discover and develop ways to bring arts integration based practices into the classroom. This learning adventure inspired an approach to teaching in which students construct and demonstrate understanding through an art form. The video above gives you a glimpse into the Infusion Cohort Program. Establish a shared definition of Arts Integration in BC. Establish a network of schools committed to Arts Integration as an approach to teaching. Develop teachers' and artists' abilities to plan, lead and assess quality Arts Integration practices. Positively influence the way teachers teach and the way students learn. Outcomes in the arts and other subject areas. Make effective and regular use of artists and cultural resources in the community. A fresh perspective on learning for both teachers and students. A flexible model to guide teachers and artists in setting goals and building links across disciplines together. Resources and discussions to support assessment of learning outcomes. An engaging, creative and inclusive approach to targeting the prescribed learning outcomes across subject areas. A way to make learning personalized and adaptable for all learners. A way to develop critical thinking and problem solving skills. An opportunity for teachers, artists and students to celebrate their learning and experiences. Infusion: Arts in Education was created by 2010 Legacies Now, with the support from the Province of British Columbia, as a legacy of the 2010 Winter Games.